Amazon is moving ahead with establishing retail activity in Israel. Two people familiar with the matter, speaking on condition of anonymity, told Calcalist that for the past few months Amazon has been in talks with Katz Deliveries, a local delivery company, regarding the possibility of making its local deliveries through Katz’ B2C subsidiary Buzzr. Founded in 2013, Buzzr provides package delivery services to private customers between 4 p.m. and 10 p.m., accommodating working hours. Katz holds a 49% stake in Buzzr. Amazon’s representatives met mainly with Buzzr founder and CEO Udi Sharon, the people familiar with the matter said. Established in the 1980s, the company employs over 550 people in seven centers across the country, making over 2 million deliveries a year according to its website. The company has a 20,000 square meter logistical center in central Israel. The company is owned by brothers Dror and Shimshon Katz. Dror Katz said he cannot comment on the matter. Amazon currently makes deliveries to Israel through the Israeli postal system, which is struggling to deliver packages to customers on time. In addition to the possibility of packages getting lost along the way, the long duration of such deliveries—as Amazon sends them from shipping centers in Europe or the U.S.—and the shipping costs may deter Israeli customers from placing orders with the company. Israelis are big online consumers, with the e-commerce segment growing around 25% a year, reaching 61 million packages sent to Israel in 2017 according to Israeli postal service data alone. Amazon is one of the most popular online retailers among Israeli consumers, alongside Asos, Ali Express, eBay, and Next. 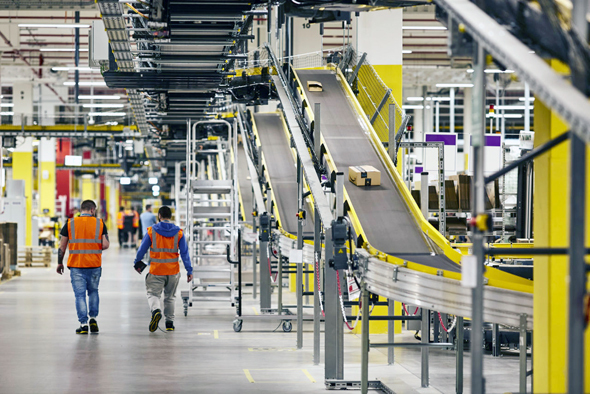 Calcalist first reported Amazon’s intention to set up a shipping center in Israel in November. At the time, people familiar with the matter told Calcalist that Amazon is interested in leasing a space of at least 25,000 square meters. The report caused the stocks of local retailers to crash by 15%-20%, and they have yet to recover, leading some large local retailers to set up e-commerce ventures of their own.